Home » Blog » Live Class on How to start preparation for CAT 2017 Online Exam? 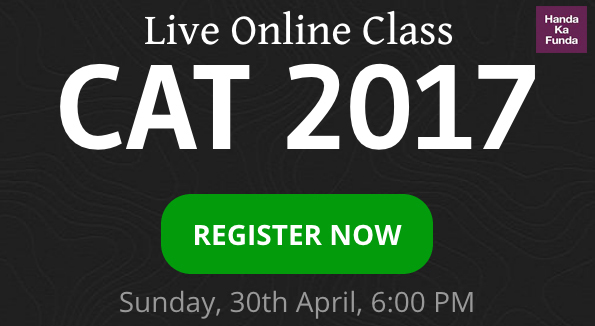 Live Class on How to start preparation for CAT 2017 Online Exam? We have conducted online live classes / webinars on CAT preparation and related topic multiple times in the past. So much so, that we even got sponsors for it on couple of occasions. The goal with these classes has always been to reach out to a wider community of CAT aspirants. While a free class get participation from a larger number of students, it generates quite a lot of random registrations as well. My thought process is that making it paid (as low as 10 Rs.) would at least ensure that junk data is a lot less if not 0. Another issue that a few students have pointed out in past webinars is that one size fits all sort of strategy doesn’t quite work. That is the reason I will be conducting two sessions instead of one. You should pick and register for the session that suits you best. If you are already an enrolled student, there is no need to register for these webinars. Agenda: What should be the preparation strategy for students who are attempting CAT for the first time? Agenda: What should be the preparation strategy for students who are repeating CAT to improve their percentiles over previous CAT attempts? a) You have some idea about how the CAT paper is structured but don’t know which areas are important. b) This is your second / third attempt at CAT and you scored more than 75%ile in your previous attempts. c) You are a member of 5+ WhatsApp / Facebook groups related to CAT preparation and are still confused about the right way forward. How do these online CAT Preparation sessions work? Step 1 – Register for the session of your choice by paying 10 Rs. Step 2 – On Saturday, 29th April – one day before the session, you will get an email from us containing the link to the live class. Step 4 – Now you will be inside the class and you will be able to attend it. In case you miss the class, a recording of the live class would be made available to you. In case you have any questions about the webinar or the entire process, you can either use the comment section on this post or drop an email to us on [email protected] You can also use the chat window on the bottom right of this page. Vinay or Tushar from our team should be able to answer most queries you have. I hope to see you all in class.